When making a first impression is important to your business, Concare has a way to help you stand out from the rest. Metallic swirl finishes, prepared and installed by Concare, are epoxy concrete floor protective coatings with a marbleized appearance. The seamless floor is applied the same way as all other high performance floor coatings…by highly experienced technicians with proven floor technology materials. Once the base color is selected, a translucent color is artistically applied with special metal particles. As it begins to cure, the pigments separate creating a unique pattern that is beautiful, intriguing and one-of-a-kind. As no two patterns are alike, your new floor can take on a single to multiple colors, all with a fresh perspective. Tell us your goal for your lobby, demo room, showroom or display area and we’ll help you achieve a winning appearance. Contact us for a brochure on metallic swirl finishes. Concrete polishing 03 35 43 on commercial floors and industrial floors provides a beautiful, high gloss finish where image and safety are important. 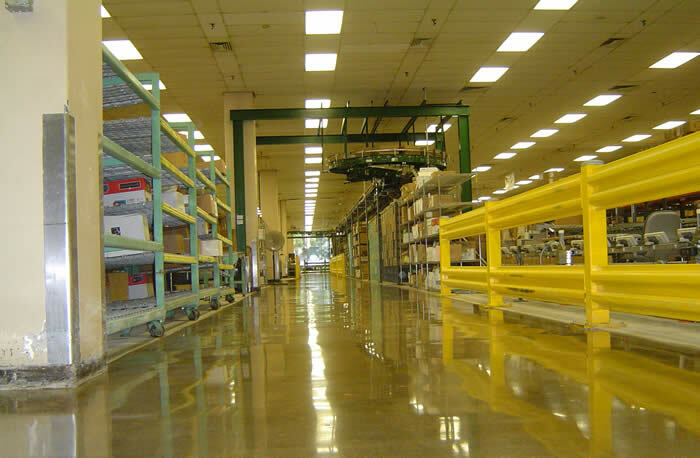 Commercial concrete polishing allows high traffic areas such as warehouse, retail stores and entertainment facilities can be designed to have a slip resistant and abrasion resistant floor finish. Industrial concrete polishing portrays a high quality corporate image especially for customer tours. Concrete polishing floors is a process beginning with coarse diamond grinding progressing to finer and finer diamond grinding reaching the desired 'look' your company wants as a final floor finish. Concare's preparation and installation team installs a hardener or densifier application, or even a clear protective coating, where stain and spill protection is essential, to the diamond ground concrete sealing in the natural beauty with a glossy finish. For a super high gloss concrete polishing floor finish, Concare final processes your industrial or commercial concrete floor one final time with a burnishing machine. Contact us to find out how concrete polishing can benefit your business.